Paris may be one of the most expensive places in the world, but the City of Light helps offset some of the higher price tags in the summer with a host of free events. After all, every little bit helps, n’est-ce pas? From pretend beaches to outdoor cinema, here are the top picks for free things to do this summer. Go for the free jazz concerts, stay for the fun shopping. The concerts, scattered around the city’s largest flea market, will liven up the afternoons, helping to ease the blow as you swipe your credit card on that 3000-euro Louis XV chair (or fantasize about doing so). Summer officially kicks off in Paris with this citywide celebration of all things performance. Just wander the streets during the city’s shortest night, and soak in the sounds of bands and DJs who play until the wee hours of the morning. Go earlier rather than later -- unless you want to see how teenage French students celebrate the end of the school year. You don’t need to be LGBTQ to appreciate Paris’s gay pride parade. Floats filled with scantily clad folks, some with leashes and others in heels, join up for a march between Montparnasse and the Place de la Bastille. While the parade is free, if you want to participate fully, you’ll probably drop a few euros for an afternoon beer or two... and maybe have a few more later in the Marais. While renting a lawn chair costs seven euros, attending the city’s best outdoor film screenings in the Parc de la Villette is absolutely free. Pack a picnic, a blanket, and a bottle or two to enjoy films from Star Trek to Gravity, or maybe an Almodovar flick. Things might get a little weird with Wes Andersen’s Rushmore, or the cult favorite, Starship Troopers. While not all technically free, many of these dance parties at the firefighters’ stations accept donations thrown into the barrel, rather than any kind of traditional cover charge. A tradition all over France, the parties in Paris can get quite rowdy, and lines stretch down the street earlier in the evening. Expect cheap drinks, dancing firemen, and a well-earned hangover the next day. To celebrate the beginning of the French Revolution -- that thing that sparked widespread use of the guillotine -- Paris kicks off the festivities with a military parade for the public along the famed Champs Elysées. Arguably the most entertaining part is the military flyover, featuring all sorts of French planes, jets, and helicopters. If you can get up early enough after the night of the firefighters’ parties, it’s free, festive, and wildly patriotic. While thousands of people crowd around the Champ de Mars in the shadow of the Eiffel Tower, you can enjoy this spectacle from any spot in the city with a view of the iconic monument. But let’s face it -- being right in front of it is the most intense experience, and totally worth the crowds. At 11pm, the 250-piece orchestra will start to play, introducing a 30-minute firework show that illuminates the tower. The storming of the Bastille probably wasn’t quite as explosive, but hey, it’s a solid commemoration. The highlight of the summer is the kitschy -- yet adorable -- recreation of the Mediterranean along the banks of the Seine and the canal in the 19th arrondissement. Family-friendly and packed daily, the Paris beaches are an oasis in the steamy summer months. Piles of sand and palm trees suddenly appear in July, when many Parisians head to the waterfront to soak up the rays. Play some foosball or join an exercise class... just whatever you do, don’t try to bathe in the water at either location. In front of City Hall, formerly the stage for some of medieval Paris’s most gruesome public executions, a new stage is set for 30 concerts of obscure and/or up-and-coming French and European artists. There are still some question marks on the schedule, so a few surprises aren’t out of the question. One of France’s most celebrated sporting events, the Tour de France arrives at its 21st and last stop in Paris on a normally hot and sweaty Sunday. 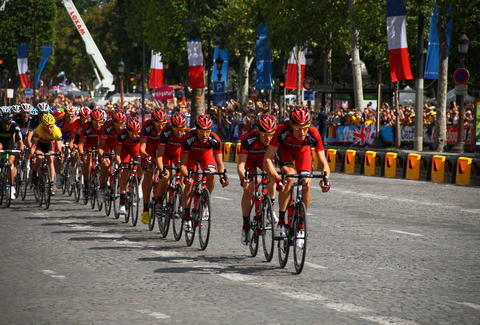 Cyclists ride laps around the Tuileries Garden and Champs Elysées before the winner -- I want to say Lance Armstrong? -- is finally rewarded in front of the Arc de Triomphe. Paris has the highest density of cinemas in the world, but in the summer, head outside and see some shows for free. This first wave of outdoor films begins with King Kong in Square Louise-Michel in Montmartre. In total, 10 films will play in iconic locations around Paris during the Cinéma au Clair de Lune, including West Side Story in front of the Invalides, and Annie Hall in Place des Vosges. In the little-known Parc de la Butte-du-Chapeau-Rouge, this short-film festival caps off the summer. Nine evenings of short films from various directors around the world light up the screen, and there are even small concerts before each screening.